When the loose-robed, shaven-head followers started showing up in airports in 1966, dancing and singing to a tune only they knew, devotees of the Hare Krishna movement were seen as odd, and a little frightening. That was 50 years ago. Hare Krishnas — or members of the International Society of Krishna Consciousness — have long since moved out of airports and into temples, farms, schools and other spaces of their own. Despite some serious setbacks — sexual and child abuse scandals took the new religious movement to bankruptcy — ISKCON is now a recognized branch of Hinduism with a nearly global presence. It has a well-respected food relief service, a series of green “eco-villages” dedicated to sustainable farming, and planned or newly dedicated temples in Ohio, New Jersey, Florida and Maryland. This edition of ReligionLink offers background, sources and other information to help reporters localize stories on ISKCON’s 50th anniversary, which the group will be celebrating worldwide through the end of 2016. The group was officially founded in the United States in 1966 in New York City by A.C. Bhaktivedanta Swami Prabhupada. Hare Krishnas revere him as a guru. The Hare Krishna movement is often considered a spinoff of the more traditional Gaudiya Vaishnava tradition of Hinduism, which dates back to the 15th century in India. Hare Krishnas are especially devoted to the ancient Hindu texts of the Bhagavad Gita and the Śrīmad Bhāgavatam. Hare Krishna adherents are devoted to Lord Krishna as the highest manifestation of God and believe there are spiritual benefits to repeatedly chanting his name, frequently to music (their mantra is, “Hare Krishna, Hare Krishna, Krishna Krishna, Hare Hare”). Remember George Harrison’s “My Sweet Lord”? He was, at one time, a devotee and incorporated the chant into that song. Adherents are strictly vegetarian and do not eat eggs. They revere the cow as sacred. Prabhupada is said to have believed that Krishna encompassed all other forms of God. Kirtanananda Swami, a major ISKCON leader, was convicted of racketeering in the late 1990s. Devotees were arrested and prosecuted for street extortion scams involving the sale of “free” Hare Krishna books. ISKCON declared bankruptcy after the payouts. But it also established a number of safeguards and review panels to ensure its children’s safety in remaining schools. By 2000, the number of monastic devotees dropped to about 1,000. 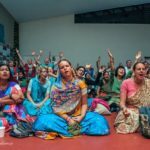 Today, scholars estimate there are between 50,000 and 100,000 adherents in the U.S. ISKCON is overseen by a Governing Body Commission of 29 men and women from different countries and temples. ISKCON News is an online clearinghouse of all news that relates to ISKCON worldwide, including temple events and member activity. The Pluralism Project at Harvard University maintains a history of Hinduism in America, including a timeline that shows the arrival of A.C. Bhaktivedanta Swami Prabhupada, the founder of ISKCON, in 1965. The Hindu American Foundation maintains a page of demographics about Hindus in America. NPR maintains a page titled “What You Need to Know about Hare Krishnas” by Barbara Bradley Hagerty that details everything from their religious beliefs to their eating habits. Bhaktivedanta Book Trust Online Ministry Inc. maintains a searchable directory of its ISKCON temples and groups around the country and around the world. Bhaktivedanta College is an ISKCON school in Belgium. It has students and teachers from all over the world, the majority of them Hare Krishna devotees, and offers courses in Bhakti yoga, the Bhagavad Gita, religious studies and a disciples course. Back to Godhead is the official magazine of the Hare Krishna movement. Read “Talking to the Hare Krishna Leader Who’s Bringing the Movement into the Age of Lululemon” by Carl Swanson for New York Magazine, May 18, 2016. Read “Krishna Devotees Look to Provide for This Life” by Greg Beato for the New York Times, March 4, 2016. Read “The palace that gas rebuilt: Hare Krishnas welcome drilling” by Anya Litvak and Molly Born writing for the Pittsburgh Post-Gazette, Dec. 13, 2015. Read “Hare Krishna at 40” by Newsweek, as posted on July 14, 2006, at Beliefnet.com. Read “Krishna Payouts Begin,” a June 26, 2005, story by Hector Becerra for the Los Angeles Times. The takeaway: ISKCON began paying out $9.5 million to more than 500 victims of child abuse, most of it alleged to have happened at ISKCON-run primary (boarding) schools, as the result of a 2001 lawsuit. Read “Hare Krishna Movement Details Past Abuse at its Boarding Schools” by Laurie Goodstein for The New York Times, Oct. 9, 1998. ISKCON has communications directors all over the world. A list of them and the regions they cover can be found here. ISKCON produces a media kit for journalists and provides stock photos. Wikipedia maintains a page of known ISKCON members and patrons that includes many ISKCON swamis around the world. Some have their own websites with contact information. Madan Gopal Das is a priest at the ISKCON temple in Towaco, N.J. The temple is working to build a new temple in nearby Parsippany and Madan Gopal Das has spoken with the press. Dharma Dasa is the head pujari (temple priest) at ISKCON Miami, a position he has served for 43 years. He is also the past temple president and is on the faculty at ISKCON’s Bhaktivedanta College in Belgium. Dharmasetu Dasa is a priest at ISKCON of San Diego, one of the largest Hare Krishna communities in the U.S. He joined ISKCON in 1974 and has served at the San Diego temple since 1977. He has been an administrator and a teacher at two Hare Krishna schools, one in California and one in Mississippi. Sayama Mohini Devi Dasi is a pujari (temple priest) at the Radha-Krishna Lotus ISKCON Temple in Phoenix. Urmila Dasi, who is also known as Dr. Edith Best, is a widely known teacher of Bhakti yoga and an associate editor at Back to Godhead magazine. She spent 19 years in administration and teaching at ISKCON primary schools and is on the faculty of Bhaktivedanta College. She also blogs. Contact via her Facebook page. Anuradha Dooney is a fellow at the Oxford Centre for Hindu Studies in Oxford, England, and is a faculty member at Bhaktivedanta College in Belgium. She is an expert on continuing education in ISKCON. Ravi Gupta is a member of the faculty at ISKCON’s Bhaktivedanta College in Belgium and is director of the religious studies program at Utah State University in Logan. He is an expert on the Vaishnava tradition of Hinduism. Seth W. Spellman is an attorney based in Alachua, Fla., who is also on the faculty of ISKCON’s Bhaktivedanta College in Belgium. He has served as president at two U.S. temples and has been a member of ISKCON since 1973. Ananda Vrindavan is a priest at ISKCON of D.C. (located in Potomac, Md. ), where she writes an inspirational blog that often touches on the 40-year-old temple’s environmental activities. Richard J. Cole (Radha Mohan Das) is a Hare Krishna monk and secretary of communications at Bhaktivedanta Manor, the U.K. headquarters of the International Society for Krishna Consciousness. In collaboration with Graham Dwyer, he has contributed to and edited a collection of essays on the Hare Krishna movement, The Hare Krishna Movement: Forty Years of Chant and Change. Also with Graham Dwyer, Cole is the co-editor of Hare Krishna in the Modern World: Reflections by Distinguished Academics and Scholarly Devotees. He regularly gives presentations on the Hare Krishna movement and specializes in writing and performing dramas based on the Vedic scriptures. Contact: Radha.Mohan@krishnatemple.com, +44 01923 851003. Contact: eugenio.fizzotti@gmail.com, +39 06-571741302, +39 348.8291299. Leslie C. Orr is a professor of religion at Concordia University in Montreal. One of her areas of specialty is Hinduism in the West. She is the author of the book Donors, Devotees and Daughters of God: Temple Women in Medieval Tamilnadu. Contact: leslie.orr@concordia.ca, 514-848-2424, ext. 2078. Federico Squarcini is an associate professor of religion at Università Ca’ Foscari in Venice, Italy. He is the co-author of Hare Krishna: Studies in Contemporary Religions. His research focuses primarily on South Asian religions. Contact: federico.squarcini@unive.it, +39 041 234 9531. Lawrence A. Babb is a professor in the department of anthropology and sociology at Amherst College in Amherst, Mass. He teaches a course on religions in South Asia and has studied Hinduism as practiced in India. He has also written about modern interpretations of Hinduism. Edwin F. Bryant is an associate professor of religion at Rutgers University in New Brunswick, N.J., where he teaches courses in Hindu philosophy and religion. He specializes in the Krishna tradition and the Hare Krishna movement. Diana L. Eck is a professor of comparative religion and Indian studies at Harvard University. She is also director of Harvard’s Pluralism Project, which explores the religious diversity of the U.S.
Maria Ekstrand is a professor and psychologist at the University of California, San Francisco School of Medicine. Her primary research interests involve primary and secondary AIDS prevention, with a focus on India. She was involved in the development of the Hare Krishna movement’s child abuse investigation guidelines. Ekstrand is co-author of a book about the history, development and current state of the movement. Joshua M. Greene is a Long Island-based author, television producer and lecturer. He is the author of Swami in a Strange Land: How Krishna Came to the West: The Biography of A.C. Bhaktivedanta Swami Prabhupada; Here Comes the Sun: The Spiritual and Musical Journey of George Harrison; and Gita Wisdom: An Introduction to India’s Essential Yoga Text. Cynthia Ann Humes is an associate professor of philosophy and religious studies at Claremont McKenna College in Claremont, Calif. She is the co-editor of Gurus in America, to which she contributed a chapter on Transcendental Meditation and Maharishi Mahesh Yogi. Jeffrey J. Kripal is a professor of religious studies at Rice University in Houston. His specialty is Asian religions in America, and he focuses on European and American translations or adoptions of Hindu ideas and practices. He wrote a chapter on Adi Da for Gurus in America and has published five books concerning religious mysticism. Nori J. Muster is a writer and artist based in Mesa, Ariz. Her 2001 book Betrayal of the Spirit: My Life Behind the Headlines of the Hare Krishna Movement chronicles the years she spent as a member of the International Society of Krishna Consciousness, as well as the movement’s inner workings and eventual decline. She has written two subsequent books, Child of the Cult and Cult Survivor’s Handbook, and is a regular presenter at the International Cultic Studies Association conferences. Burke Rochford is a professor of religion at Middlebury College in Middlebury, Vt. His teaching and research focuses on contemporary religious movements and communities in the United States, with a particular emphasis on the Hare Krishna movement. He is the author of Hare Krishna in America, as well as numerous articles on the development of the Krishna movement. “A Hinduism source guide: Exploring a diverse, growing community,” updated July 9, 2014.